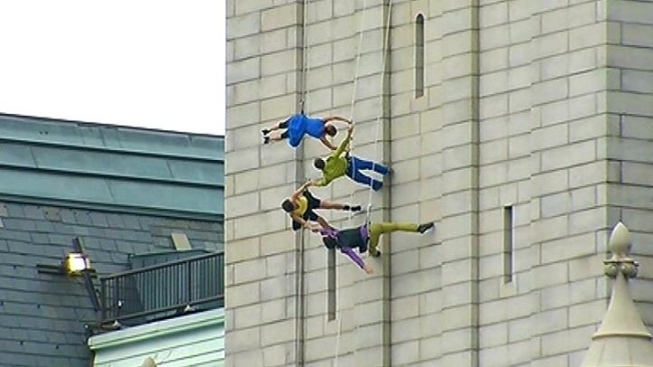 A crowd of onlookers had their heads tilted back, watching the dancers of Project Bandaloop rehearse on the face of the Old Post Office Pavilion on Pennsylvania Avenue on Wednesday evening. The practice run will give spectators a sneak peek at Bound(less), part of the Kennedy Center's Look Both Ways Festival this week. The festival offers performances in unexpected spots around the city. Founder and Artistic Director Amelia Rudolph is supervising the performance and says the building's facade is a challenge -- so the performance has been adapted for the building. Project Bandaloop has performed on various towers, skyscrapers, and even bridges, but each building requires a unique approach. The performance will feature a single dress worn by three women and a tethered group dance. The main (free!) performance is Friday at 9 p.m.